Many people are unaware that they have joints in their spine. There are two tiny facets one on each side of each vertebra to keep the spine stable. As do the shoulder and the knee, spinal facets joint two bones: the vertebra above and below. Spinal facets are true synovial joints. They have a capsule (synovium) that is lubricated by fluid and are filled by a network of pain-sensitive nerve fibres. These small, delicate joints are prone to injury, deterioration, and, in some diseases, inflammation, and they sometimes become sources of chronic neck and back pain independent of the discs and spinal nerves. After muscle pain, facet pain is probably the most common cause of low-back pain. Lumbar-facet pain is the most common (though facet pain can occur in any part of the back). The telling sign of lumbar-facet pain is black and possibly buttock, groin, and thigh pain, especially while sitting or arching your back, which increases the pressure on the facets in the back of the spine. Bending forward or lying down usually relieves lumbar-facet pain. Cervical-facet pain is the second most common facet problem and may cause headaches, shoulder, and occasionally arm pain. These facets are often more painful when the neck is bent backward or to the sides, which increases pressure on the facets. Headache from facet pain (cervicogenic headache) occurs in the morning after a night tossing and turning, which also increases pressure on these joints. Thoracic-facet pain is less common. These joints become injured when excessive amounts of rotation and extension cause a sharp pain anywhere between the upper shoulder blade and the area over the lower ribs. Pain from thoracic facets doesn’t usually travel to the side or front of the chest. Thoracic vertebrae form a relatively immobile segment of the spine compared to the highly mobile neck and lumbar area. Therefore, the thoracic discs and facets are less likely to wear out. The vertebral bodies, separated by the discs, make up the front of the spine and carry the weight of the structure. As the discs degenerate, the facets end up carrying more weight than they should, leading them to wear down and become painful. When facets wear out they can become arthritic, just as occurs in other joints, such as the knees, hips, or fingers. Osteoarthritis usually develops in the facets of the neck and lower back. The synovium wears out, bone surfaces rub together, and the facets become painful. With time, calcified outgrowths, called osteophytes, develop around the facets, degenerated discs, and supporting ligaments of the spine. The result is loss of flexibility and possibly pain. Being overweight is an increasingly common cause of problems with lumbar facets. Heavy people wear down their discs earlier and therefore may develop chronic facet pain – among other spinal problems – early in their lives. Spondylolisthesis or slippage of one vertebra over another can also cause low back pain from the facets and other structures. Pain can be controlled by treating the facets only if the slippage is of a low degree and the spine is relatively stable. If the vertebrae wiggle significantly, facet treatment won’t be enough. Medication and lifestyle modification may help you to tolerate your back pain; if they don’t, surgery – fusion – is needed to stabilise your spine. Facet problems are identified by the pattern of referred pain, local tenderness over the site, and pain in certain body positions. Your doctor will try to find the pain by poking or moving the suspected painful areas during a physical exam. Physical examination should reveal tenderness over the affected facets and possibly painful trigger points in overlying or nearby muscles and in one-sided lumbar pain, possibly pain in the sacroiliac joint and bursa overlying the hip on the same side as the painful facets. To make the diagnosis of the facet pain and accompanying myofascial or other test-negative pain and to exclude other possible anatomically based causes of pain, it may be necessary to have a MRI of the painful areas of the spine, and possibly, of the painful pelvis and hip. Chronic facet pain may come from long-term changes in the joint, detectable by radiological studies, even though facet pain itself is not. Normal appearing facets may hurt, and those that appear arthritic may not. Therefore, facet pain is a test-negative condition, one whose diagnosis is made clinically (using history and examination), not by radiological or other conventional studies. An acute episode of facet pain can be treated with rest, medicines or physiotherapist. You may need injections of local anaesthetics and corticosteroids into any especially painful muscles with trigger points (myofascial pain) associated with the facet problem. If relevant, the bursa overlying the hip may also be injected before starting to exercise. This needed exercise may be painful for the first few weeks. Diagnosis and preliminary treatment of chronic facet-related pain can be done by injections into the facets or the nerves supplying these joints. Just as epidural injections are used to treat root pain within the spinal column, facet-joint injections are sometimes used to diagnose and, for the short term, treat pain from the facet joints. If the facets are in fact the sole or a major cause of pain, injections of anti-inflammatory corticosteroids and local anaesthetics directly into the joints or over the nerves transmitting pain impulses from the facets to the spinal cord may reduce pain and facilitate the rehabilitative therapy. The injection of anaesthetic briefly blocks the pain signals emanating from the joint, and the corticosteroid reduces any inflammation of the joint and surrounding structures. 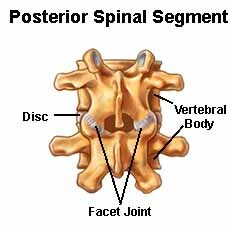 Facet are small joints, one on each side in the back of the spine, that connect two vertebrae. Facets keep your spine stable but are not made to bear considerable weight. Facets forced to bear weight as the discs degenerate are prone to degeneration. After muscle spasm, facet pain is probably the most common cause of low-back pain. Facet pain can occur anywhere in the spine. It is most common in the lower back. Facets that appear normal on radiologic studies may hurt, while those that appear arthritis may not. Osteoarthritis can develop in the facets of the neck and lower back. Being overweight causes problems with lumbar facets sooner rather than later. Call +65 64712674 for an appointment to treat Facet Pain today. Same day appointment.